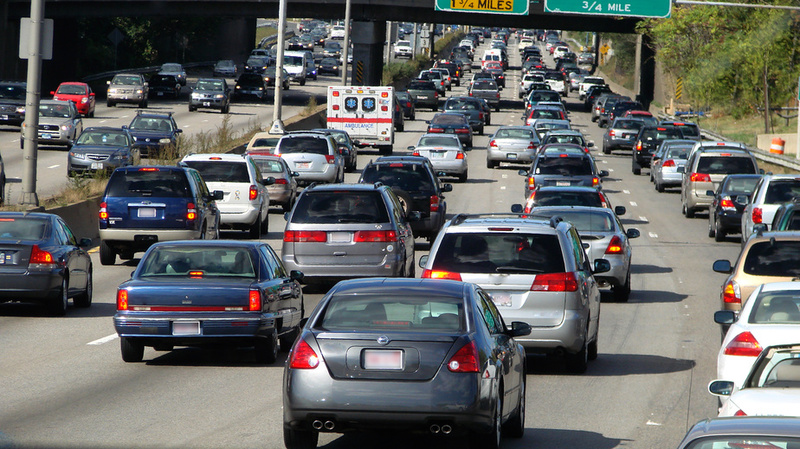 For the last 12 years, we’ve lived in the worst traffic capitals of the United States. After slogging it out on Los Angeles roads for years, we were thrilled to leave its awful traffic behind. Sadly, right after we left, our new hometown DC overtook L.A. for the worst traffic congestion in the country. (We promise, it wasn’t our fault!) DC area radio station WTOP even started giving out the Commuter Idle, an annual award for the longest commute. They recently announced this year’s winner – he commutes 7+ hours a day. That means on days when all goes smoothly, he commutes over 3.5 hours each way. 5 days a week. WTF? A big priority in our lives has been to keep our commutes as short as possible. In our perfect world, no place we need to go regularly would be more than a 10 minute walk away. So learning about the Commuter Idle got us wondering wonder what motivates people who choose to make really long commutes a regular part of their lives, especially given all the studies showing how bad it is for you. Can they simply not afford to live closer? Is their house so amazing or job so unusual or fulfilling that it’s worth it? Are they tied to their hometown because of the unique needs of a family member or a particularly tight-knit community? Or is commuting their happy place, their escape from the stresses of home? It’s hard for us to understand because we don’t want to spend one second more commuting than absolutely necessary. For us, minimizing commute time is not about increasing predictability of transit time (though predictability is nice) or simply hating traffic (though we do). It is not about hating to drive (D loves driving, and has been known to test-drive new cars for fun). Nor is it about avoiding the many negative financial, health, well-being, and environmental effects of long commutes (though we’re all for avoiding those!). Rather, minimizing our commutes is crucial to our ability to be our best selves. Every minute we spend commuting is a minute we’re not doing all the other stuff we’d rather be doing – i.e., trying to be the people, parents, partners, and professionals we want to be. Sure, we’ve found ways to incorporate the things that matter into the minutes we have to spend commuting. We incorporate exercise by commuting on foot or bike whenever possible; during the warmer months our kids often grumble on days we take them to school in the car instead of the bike trailer. We use time commuting with our kids to talk about their days, sing silly songs, or play games like I Spy. We use time commuting solo to catch up on the news, call friends, read, or check email (not while driving, of course!). Still, we would so much rather be moving our bodies, connecting with our kids, or catching up on work or personal stuff in places and ways of our choosing – where we don’t have to split our mental energy between the things that really matter and traffic, directions, train schedules, or other commuters. Pre-kids, we didn’t think twice about moving to cut down transit time. Our biggest coup on that front was moving across Los Angeles to cut D’s one-way commute down from 35 miles to 10 without lengthening B’s commute. That move saved him between 45 minutes and 2 hours in the car daily. Less than a year later, D’s company moved within a 10 minute walk of where we lived. Score! Moving frequently with kids isn’t optimal, so a significant consideration in buying our current house was its accessibility to areas where we’re most likely to work over the next few decades (which happen to be in opposite directions). Although we haven’t yet figured out how to get every commute down to a 10 minute walk, we don’t leave our commute times to chance. We’ve scoped out every possible route (car, public transit, foot, and bike) to places we go regularly, including our kids’ schools and extracurriculars (we even factored in proximity in choosing those). We avoid commuting in rush hour whenever possible and telecommute when we can. We can both rattle off the top of our heads which routes are best at different times of day and days of the week. And even so, D obsessively checks traffic on Google maps every single time he gets in the car, always looking for a way to shave off a few minutes here or there. Yes, all this takes time and effort, but we think (hope!) it saves us time in the long run. So until human teleportation becomes a reality, we’ll keep doing all we can to keep our commutes as short as possible. What about you? How do you feel about commuting? What trade-offs would you make for a shorter (or longer) commute? Curious about the hard costs of your daily commute? Get a quick answer using a simple commuter calculator (we happen to like this one because it includes environmental impact, but you can find similar calculators online localized to all different parts of the country). I commute daily and have already accepted that some traffic jams are unavoidable fact of life but the worst is when you hit a terrible unexpected traffic jam due to an accident or construction, etc. This is something that happens more than often and leads to wasted time accompanied with a lot of stress. I have searched for apps on my iPhone to check the traffic map of my daily commute but did not find anything that is straightforward and can be easily customized. Most apps are bloated with too many features that we as daily commuters don’t care such as turn by turn navigation, route planning, etc. These are good features but for general navigation not for commuters who are already familiar with the area. Worst of all, the existing apps consume phone’s battery like crazy. So, I eventually decided to develop a simple app to do the job. The app is called “Commute Pal” and helps the users to quickly set up home and work addresses and check the traffic between their home and work with minimum interaction without any registration. The app is freely available on the iTunes App Store for everybody to download. Check it if you are also facing the same problem as me. If you downloaded and liked it, please spread the word and leave us feedback so it can get better. Hopefully, we can use technology to outsmart the traffic. Thanks. thank for the great tip! Two cities have worse commute time than DC are: San Francisco and New York. We are in one of those. our metro areas are just getting worse and worse! Right now I have a 20 minute walk to work, 15 if I speed walk. I am so terrified of losing the convenience, we continue to live in a one bathroom apartment with an 18 month old just so we can continue to walk to work. It’s very reassuring to know that I can always get home in the exact same amount of time. We completely get your fear of giving up that proximity. Being able to get to our kids pretty quickly also gives us peace of mind. I think a perfect commute to and from work is approximately twenty minutes. This gives me time to think about the day on the drive, and to mentally decompress on the way home. At most, I think a 45 min. commute is doable. Anything past 45 minutes, and I think I would start to hate the drive, and to start to look for other, closer options.